Wedding is one of Thousand Hills events in Branson that you can celebrate with your friends and family on the most romantic day of your life. Thousand Hills Resort is a great place offering many other special events that include birthday party, reunion party, anniversary, corporate events, conference, meetings, and much more, but wedding is one of the most popular Thousand Hills events where your guests can enjoy a great variety of accommodation options. Thousand Hills has many reasons why you want to plan your wedding reception in this beautiful resort. The food is great and the resort has a creative chef that will closely work with you to make the menu suitable to your taste. The expert catering team of the resort will prepare entrees that can be served to your guests a la carte or at a buffet table. The resort also offers newly-wed couple great accommodations in its secluded honeymoon cabins, luxury golf front or lake front condominiums. The amenities of the resort are also outstanding which include seven pools, tennis court, exercise facility, arcade games, outdoor hot tubs and children’s playground area. While all the guests savor each moment at the reception, Thousand Hills staff will be working hard for you and your guests. The resort’s friendly and gracious catering staff will see to it that all guests are enjoying the event. After the wedding reception, you can stay at a quiet and romantic condominium or log cabin with spectacular views of the Ozark mountains. Thousand Hills Resort offers different types of suites that are perfect for your honeymoon. The most requested honeymoon suite is the log cabin. This log cabin is beautifully decorated, with gas fireplace, private screened porch and large two person Jacuzzi tub. The kitchen is also furnished with modern appliances such as fridge, microwave oven, washer/dryer, dishwasher, kitchen wares and utensils and much more which make the place your home away from home. Some of your wedding guests may probably like to take a glimpse of the most popular golf course in Branson, the 18-hole golf course at Thousand Hills Golf Resort or spend a relaxing moment with a great view of the pristine lake around the resort. Some of them may also like to spend a wonderful time in the heart of Branson which is just minutes away to exciting attractions, museums, live entertainment shows, great shopping places and fine restaurants. Near the resort, you can also get to see some of the most visited Branson attractions such as White Water Park and the area’s biggest discount mall, Tanger Outlet Mall. Also conveniently located near the resort are the Sight and Sound Theater and the White House which features Kung Fu Artists. You will get the chance to enjoy also exciting outdoor activities near the resort such as hiking, biking and horseback riding. 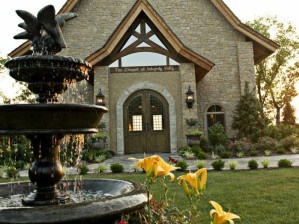 So, if you want to get married soon, plan a wedding reception at Thousand Hills Resort in Branson and stay at one of its many cozy accommodations.